I couldn't see a thread for items we've found and I don't always see the posted items in the season/non-season progress threads, so I thought this could do with it's own place. 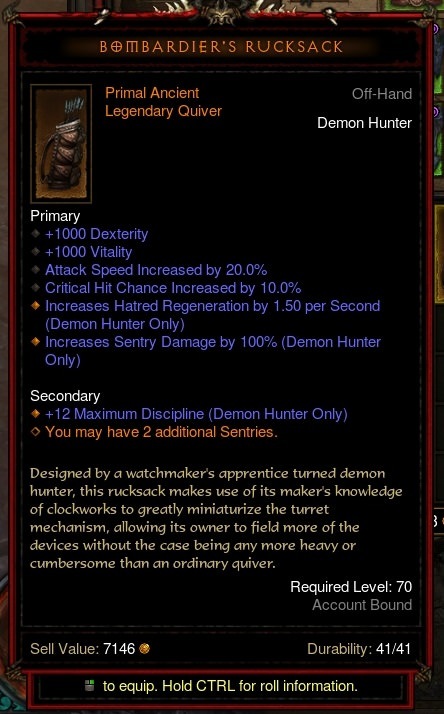 I'll start off with my very first Primal item. You know I have no clue what are the OMG I JUST FOUND x!!!! items in D3. While it is nice that you can find items to have a good character there is no Zod or working to build BoTD. Generally Ancients with ideal rolls for your build are exciting. One can never have too many of those. The fact that they are not in D3 is just sad. edit: the sword, not the belt. I like Krelm Buff Belt for some builds. That extra running speed between fights helps you get through a Rift or GRift faster, and if it's Primal, it's got some good stats on it. Nice sword! Those 2 swords are hard to find, at least for me they are. I haven't found too many of those. I don't think I currently have an M6 DH on Euro. Looks like that will have to change. I guess I should have put this here. This is from a reforge. Nice! I gotta try a Monkey King build again sometime. Last time I tried it, I couldn't figure out how it's supposed to work, especially Sweeping Wind, so I switched to something else.